The handmade, donated items serve as a landmark, a way to take something away from the program to set up a new home. When Barbara Kelly heard about The Salvation Army Adult Rehabilitation Program (ARP) in Chico, California, during a yoga class, she decided to encourage the women seeking treatment there the best way she knew how—by sewing them colorful quilts with prayers and messages of empowerment embroidered in them. 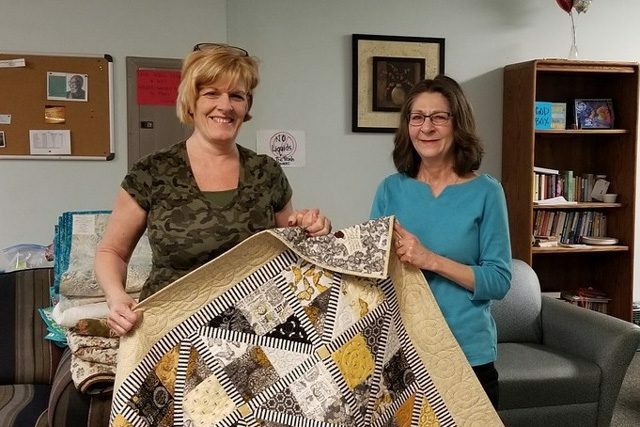 After approaching Jodene Setera, Chico ARP office manager, with her idea, Kelly turned to her fellow quilters for help. She recruited volunteers from her local Annie’s Star Quilt Guild and Sew Sisters group in Chico, as well as other quilters outside the area. Since starting the project, they’ve made 20 quilts for the women in the ARP, with more to come. When Kelly and her friends delivered the first 15 quilts to the women, it was an emotional experience for everyone. Setera said the quilts left a lasting impression on the women at the ARP. The quilts are all different designs and colors, and have encouraging messages stitched into them. One of the quilters even made what she called a “companion quilt” out of the same design with the extra remnants for herself, so she could continue to pray over the woman who received her quilt. “It was just a powerful connection, as women were sending these healing thoughts through their artwork,” Setera said. Major Ray Yant, Chico ARP Administrator, said that the quilts have a unique impact on the women as they get to keep their quilt after graduating the program. Chico ARP client Tammy Thompson (left) receives her quilt from Cassy LaVigne, who made it for her. This is exactly how Sandy Nethington, who graduated the Chico ARP in July, felt when she received her quilt. “Taking it home is just a reminder of where I was and what I’ve done, and every day I get to use it and it takes me back to what I’ve had to do to get to where I’m at right now,” Nethington said. Kelly hopes the program expands to where the women can also learn to make their own pillowcases or quilts. Ultimately, she wants them to feel supported.